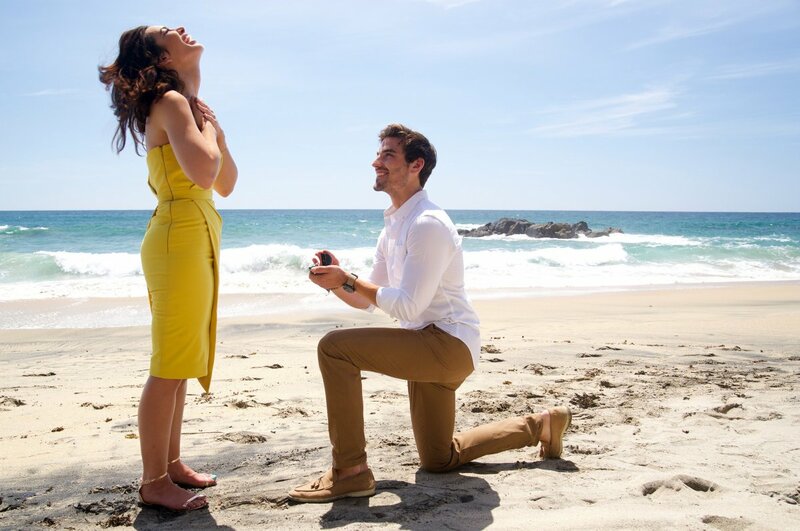 'Bachelor in Paradise's Ashley Iaconetti and Jared Haibon are engaged! Bachelor in Paradise couple Ashley Iaconetti and Jared Haibon's unique love story has taken a thrilling turn. Ashley and Jared are engaged to be married, Us Weekly reported. ABC has already confirmed the engagement news by releasing a photo of Jared proposing marriage to Ashley on a beach. "I didn't even tell my grandma yet..." Ashley, 30, tweeted Monday along with an emoji of a diamond ring. In the official ABC photo, Jared was on bended knee while sporting tan pants, a white button-down shirt, and boat shoes. As for Ashley, she was wearing a knee-length yellow dress and flat sandals. Ashley's expression in the picture is priceless, as she's exuding pure joy. She threw her head back with an enormous smile on her face and crossed her hands over her heart, appearing to be in shock. Jared, 29, reportedly popped the question to his longtime best friend on a beach in Mexico on Sunday while they were filming the upcoming fifth season of Bachelor in Paradise. Although the pair went out on a couple of dates and exchanged a few kisses over the last several years, Jared kept Ashley in the friend zone until they officially began dating in March 2018. The couple -- who also both appeared on Bachelor in Paradise 3 in 2016 -- confirmed their romantic relationship during the May 22 episode of the YouTube series Ashley hosts, The Story of Us. Ashley and Jared's dating news shocked the world given their three-year "are they or aren't they" saga. So what's next for this happy couple? According to the magazine, Ashley and Jared have yet to move in together. "[That's] like over six months down the road," Ashley said. "I'm like, 'Oh, this is my last time to not live with a boy for the rest of my life.' So, like, I'm going to need a couple of mental months to prepare myself for that." Meanwhile, Jared gushed to Us, "One of my favorite parts is that we've known each other for so long, and we're so comfortable with each other. And yet, for me, I have this puppy love toward her that's amazing." After the pair get married, Ashley and Jared admitted they "don't have a timeline" when it comes to welcoming children, but Ashley would like to start trying for a family in a few years. Prior to their first stint on Bachelor in Paradise, Ashley competed for Chris Soules' heart on The Bachelor's nineteenth season, and Jared fought for Kaitlyn Bristowe's heart on Season 11 of The Bachelorette.